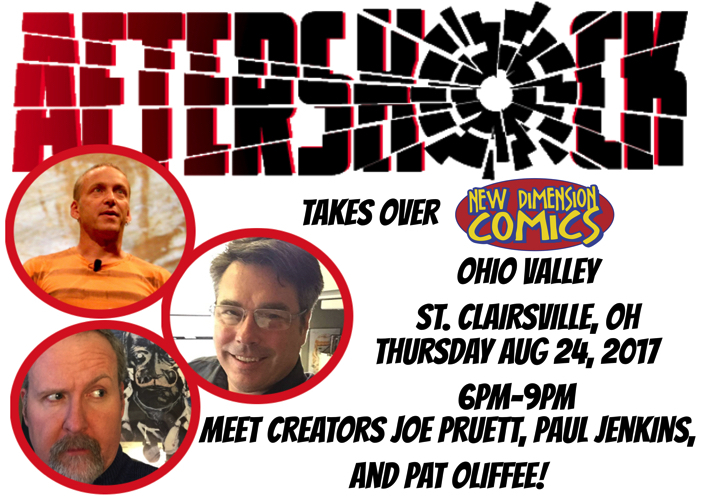 Meet Creators Joe Pruett and Paul Jenkins! In addition to be being the Publisher / CCO of AfterShock Comics, Joe Pruett is an Eisner Award winning comic book editor, publisher, and writer, having been nominated for numerous Eisner, Harvey, and Eagle awards for his work on Negative Burn at Caliber Comics. He is also known for his writing work at Marvel, where he wrote for X-Men Unlimited, Cable, and Magneto Rex. In addition to his X-Men writing work, Joe has written for virtually every other major comic publisher including Image, Vertigo, and IDW. Paul Jenkins has been creating, writing and building franchises for over twenty years in the graphic novel, film and video game industries. Over the last two decades Paul has been instrumental in the creation and implementation of literally hundreds of world-renowned, recognizable entertainment icons. From his employment with the creators of the Teenage Mutant Ninja Turtles at the age of 22 to his preeminent status as an IP creator, Paul has provided entertainment to the world through hundreds of print publications, films, video games, film and new media. With six Platinum-selling video games, a Number One MTV Music Video, an Eisner Award, Five Wizard Fan Awards, and multiple Best Selling Graphic Novels, Paul Jenkins is synonymous with success. He has enjoyed recognition on the New York Times bestseller list, has been nominated for two BAFTA Awards, and has been the recipient of a government-sponsored Prism Award for his contributions in storytelling and characterization. Paul’s extensive list of comic book credits include Batman and Hellblazer for DC Comics; Inhumans, Spider-Man, The Incredible Hulk, Wolverine: Origin, Civil War: Frontlines, Captain America: Theater of Warand The Sentry for Marvel Comics; and Spawn for Image Comics. Patrick is a veteran comic book illustrator with over 25 years of experience, working for such publishers as Marvel, DC, Dark Horse and Disney. His long list of credits include Untold Tales of Spider-Man, Spider-Girl, Thor, Captain Marvel, X-Men Gold, 52, The Atom, Superman, Batman, Wonder Woman: 52 Aftermath The Four Horsemen, Catwoman, Barb Wire, plus The Avengers, Captain America Joins The Avengers and The X-Men for Disney’s Marvel Press. He is thrilled to be working with Adam Glass on Aftershock’s Rough Riders! ← LEGENDARY BASEMENT SALE – SAT SEPT 30 (ELLWOOD CITY)!